How should we tax companies in a world of mobile capital and global corporations? How should we encourage corporate investment and discourage financial engineering? How should we reduce the taxation of labour? How should we tax rent, rather than productive activity? How should we discourage complex tax avoidance? How, not least, should we reduce incentives for a global race to the bottom on taxation of companies? These are immensely important policy questions. They matter not only for the ability of governments to raise revenue, but also for the political legitimacy of capitalism. Sadly, some good answers to these questions were under discussion in the recent US debate on reform of corporate taxation, but were buried in the end. The reform had two principles: tax would fall on cash flows and it would apply to the destination of corporate transactions, not to their origin. Some experts have proposed a system known as a “destination-based cash flow tax”. It has much in its favour. The tax base for such a system would be non-financial inflows, less non-financial outflows. (A base that includes financial inflows and outflows is also feasible. But I will ignore that here.) The costs of investment and labour would be deducted as made, but no deduction would be allowed for financial costs. The full expensing of spending on investment would make the government a partner in investment projects, contributing to them and gaining returns from them in equal proportion. The tax would ultimately bear on corporate rent — returns above the costs of the factors of production (including capital) needed to create them. Rent is also what we should tax. A significant benefit of this system is that there would no longer be today’s bias in favour of debt finance, which creates significant risks to economic stability, as the financial crisis demonstrated. More broadly, much of the financial engineering we witness must be driven by little more than the desire to avoid tax. This provides no social benefit whatsoever. The other big change would be towards taxing consumption (destination) rather than production (origin). One way of thinking about this is that we would be replacing the current effort to tax profits where they are created with a value added tax that exempts labour costs. Exempting labour costs is evidently attractive. Furthermore, under taxation by origin, companies have an incentive to move their production to low-tax jurisdictions, away from the jurisdictions that made them successful. In today’s circumstances, what with the internet and the role of intellectual property, much of this relocation of productive assets is just a (highly profitable) figment of the imagination. 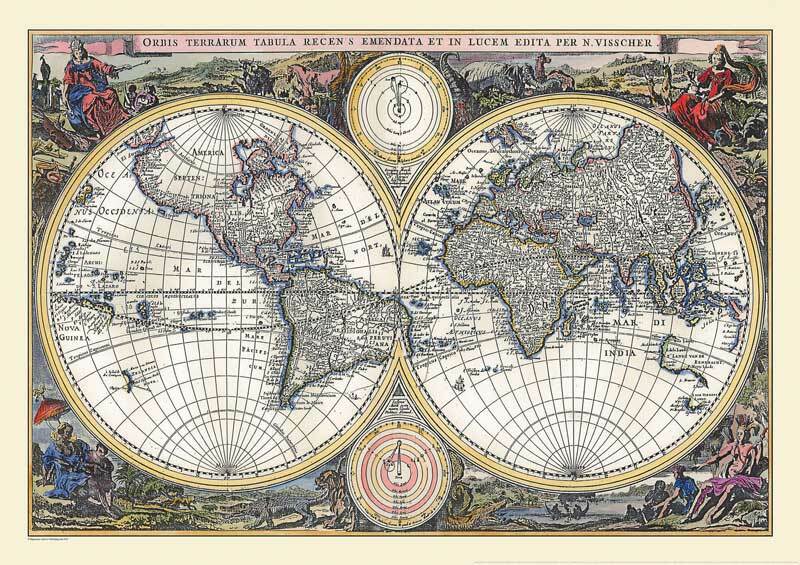 But destination is not a figment, since it is far harder to obscure where something is sold than where it is made. The shift to destination taxation would force companies to pay taxes in the markets that matter. One of the big attractions of this reform is that it would benefit a country, even if it made the shift on its own. The incentive to invest in the country making the change would increase, because of the full deductibility of investment. The new tax would be relatively simple to impose, since it would be levied on the sales of a company in its own markets. More attractive still, if a country introduced this form of taxation it would cease to impose corporate taxes on domestic production aimed at foreign markets. This would create a sizeable incentive to shift production into the country introducing the reforms. That incentive might persuade other countries to follow suit. That is why the failure of the US to implement the envisaged reform was such a pity. But the post-Brexit UK should urgently consider the proposed reform for itself. It would improve the incentive to invest; it would make the UK a more attractive base for production for world markets; and it would largely eliminate the unfairness of lightly taxed companies, based abroad, undercutting domestic competitors. The reform would create challenges. One is that exports from resource-based companies would not bear the tax. A specific tax on resource rents would be needed, therefore. Problems, albeit soluble ones, also arise in the treatment of financial companies. Yet the big point is clear. The present origin-based corporate tax system, especially with deductibility of interest and insufficient deduction for spending on investment, is creating huge problems. Instead of tinkering endlessly with it, we need a more radical reform. Destination-based cash flow taxation is that reform. Somebody needs to try it. Many have underestimated the Venezuelan president’s staying power. Despite countless protests over the past several years and mounting international pressure, Nicolas Maduro is still president of Venezuela. Most government institutions at the national level still report to him, the military continues to back him and his diplomatic staff continue to carry out his agenda. This all suggests that his tenure in office is far from over, despite what his opponents, especially opposition leader Juan Guaido, would have people believe. Indeed, two and a half months after Guaido declared himself president, Maduro is still calling the shots in Caracas. It seems many, including the United States, have underestimated Maduro’s grip on power and overestimated the opposition’s ability to bring about regime change. Only a couple months ago, Guaido appeared to have momentum on his side, having won the backing of several foreign governments and having organized protests that seemed to test the limits of Maduro’s control. But several indicators now suggest that the momentum has slowed. First, the Venezuelan government continues to conduct business as usual with allies like Russia. This week, about 50 Venezuelan companies will arrive in Russia to sign a series of business deals. The Venezuelan government expects at least 20 agreements to be signed on issues such as the economy, trade, culture, power, engineering and education. Russia clearly wants to show the world that it believes Maduro and his government are here to stay. Second, anti-Maduro governments have made subtle moves that suggest they see no end to the crisis in sight. Last week, the International Contact Group, an organization of eight European countries and four Latin American nations aimed at negotiating a settlement to the crisis, concluded its second meeting and announced a third meeting to be held in Costa Rica in May, which means the group expects the crisis to continue for at least another month. There are also growing rumors that members of the Lima Group may be second-guessing Guaido’s ability to oust Maduro and contemplating throwing their support behind the International Contact Group’s efforts to negotiate a resolution. Washington is also reportedly growing frustrated with the slow pace of change in Venezuela, but nothing yet suggests it will change its strategy. Lastly, it’s worth noting some poignant comments made by former Colombian President Juan Manuel Santos last week. He pointed out that Maduro needs a “dignified exit,” without which he will be forced to fight to the bitter end. Santos worked extensively on Venezuelan issues during his presidency and is arguably one of the world’s leading experts on Maduro and his government. His comments imply that the only way to get Maduro to step down is to offer him a deal that will allow him to save face. And without such a deal, Venezuela may be facing a prolonged internal conflict that could last years. Given the level of opposition against him, how has Maduro managed to stay in power? The answer is largely related to his continued control over the security forces. The opposition has repeatedly called on the country’s armed forces to defend the constitution, support the will of the people and abandon Maduro – but so far, they have stayed loyal to the government. According to the International Institute for Strategic Studies, the armed forces have 123,000 active military personnel and 8,000 reservists, though the Defense Ministry says the armed forces have 95,000-150,000 troops. The opposition claims that over 80 percent of the armed forces no longer support Maduro, but so far, only about 1,000 members have defected – and all of them have chosen to seek refuge in foreign countries rather than stay and fight alongside the opposition. The government has managed to keep military personnel loyal through its lucrative patronage network that connects military, government and black market activities and rewards participants with money, food and power. The government also has highly developed policing mechanisms within the military, ensuring that potential defectors can be quickly identified and family members easily targeted to deter any dissension. The government also counts on two civilian groups to help maintain control, particularly in the streets. The first is the Bolivarian militia. Estimates on its size vary widely: The opposition claims it has as few as 20,000 active members, while the government claims it has 100,000 active members and the IISS says it has 220,000. 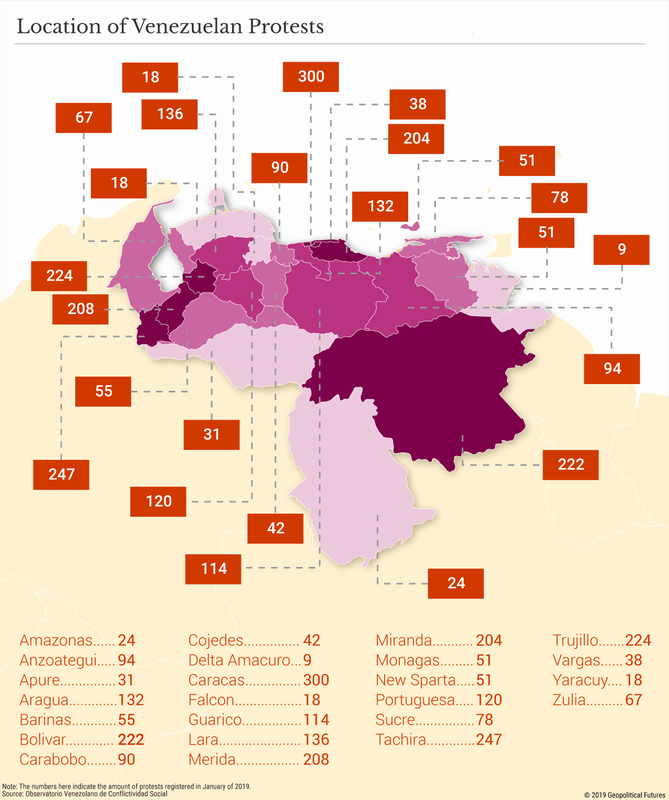 Then there are pro-government armed groups known as “colectivos.” The Bolivarian militia and colectivos may not have formal training or professional equipment, but they do provide valuable support to the military. Indeed, the government has used a combination of civilian groups and military forces to maintain order many times in the past. 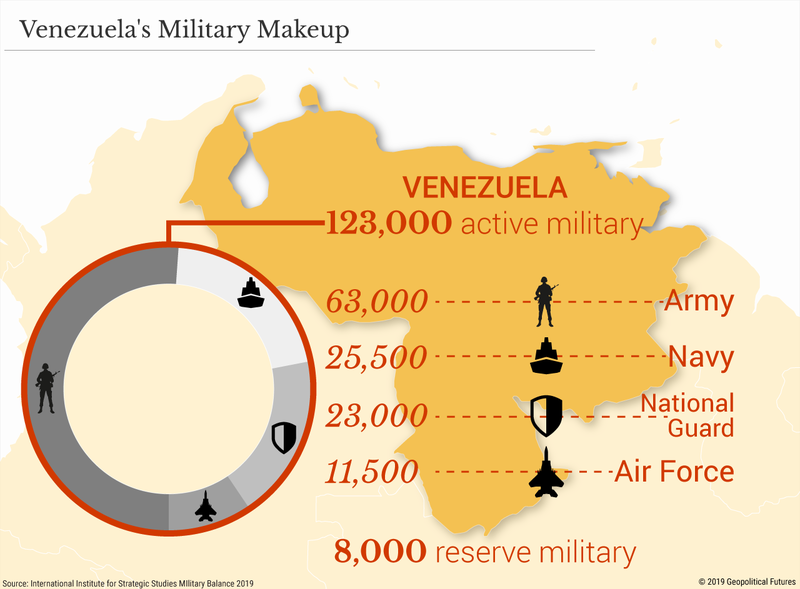 In 2017, for example, Maduro deployed 200,000 personnel – including both civilian militias and military – to quell widespread anti-government protests. In February and March, the government conducted civil-military drills that focused on securing and defending electricity and water facilities. In terms of finances, the Venezuelan economy has been in ruins for years now, yet the Maduro government has nonetheless managed to get by using a combination of black market activities to support its patronage network and formal economic mechanisms, such as gold reserves and cryptocurrencies, to conduct trade and oil sales despite U.S. sanctions. Here, support from countries like Russia and China has been essential; these countries have extensive experience skirting U.S. sanctions. But Maduro’s staying power has also been a result of the opposition’s weakness. The Venezuelan opposition has two key challenges. First, it doesn’t have access to sufficient arms or training to be able to take on a professional military. This is one reason the opposition needs to pull more members of the military over to its side. Second, it lacks a patronage network that can be used to entice military personnel to join its cause. The opposition has offered amnesty to members of the military who defect, but its ability to follow through has to be questioned considering that Maduro still controls the government. Any attempt to revolt would be met with serious consequences. The opposition has also struggled to convince some Venezuelans not to become complacent. Venezuelans have proved extremely resilient and resourceful, finding numerous ways to survive despite years of food shortages – including bartering over social media, constructing small garden plots, saving rain water and starting creative entrepreneurial endeavors. The opposition has repeatedly reminded protesters that they shouldn’t get used to substandard living conditions, especially as finding ways to cope becomes increasingly difficult. It calls for more protests every time there’s a water shortage, power outage or major transport disruption not only to send a message to the government but also to prevent the people from raising the threshold for conditions they’re willing to tolerate. The pressure is now on the opposition to announce its next steps. It has started what it calls “Operation Freedom,” a campaign to force Maduro out of office, consisting of some 800,000 registered volunteers (at least according to the opposition) who help disseminate information and organize protests. In phase one of Operation Freedom, the group is planning a mass, nationwide protest – the date has not been set yet but a rehearsal is scheduled for April 6. If this all sounds like more of the same, that’s because, in many ways, it is. The opposition has held rally after rally – including on Feb. 23, when Guaido promised that foreign aid would be allowed into the country, and on Jan. 23, the day Guaido declared himself president – but so far none have managed to convince Maduro to step down. Doing more of the same hoping it will bring about a different result isn’t a promising strategy. There’s also been no mention of what will follow phase one, or even how many phases Operation Freedom involves. It’s possible that the opposition wants to keep parts of its plans secret for strategic reasons, but it’ll need to share at least some of its strategy to convince the public it can oust Maduro. Without doing so, Guaido is in danger of losing even more momentum. To that end, Guaido is now more openly considering getting foreign militaries involved. Initially, the opposition wanted regime change to be imposed using only domestic forces. But faced with the reality that a revolt can’t happen without arms and troops, Guaido appears open to accepting outside support. He even pointed out that, when the British Legion fought with Simon Bolivar for independence in 1819, it was not considered an invading force but rather a source of support. 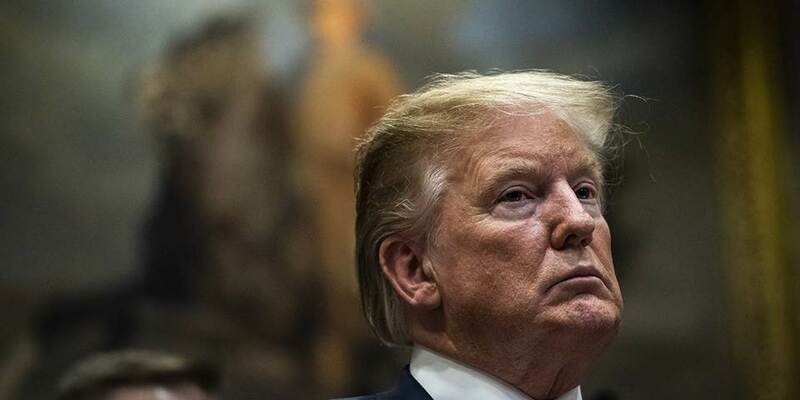 He also said he may apply Article 187.11 of the constitution, which allows the National Assembly to approve foreign military action in Venezuela. (This clause is normally used to allow for military cooperation, humanitarian missions and joint military exercises.) If the opposition were to use this clause, it could be accused of contradicting itself – insisting it wants Venezuela to control its own fate but inviting U.S. support when it suits its interests. But getting foreign military assistance would be extremely difficult at this point. The countries most likely to help would be the U.S., Colombia and Brazil, but they have all clearly stated they will not intervene militarily. Even the presence of 100 Russian military personnel in Venezuela won’t be enough to change Washington’s approach. According to Russian Foreign Minister Sergey Lavrov, the Russian troops in Venezuela are there to service military equipment delivered to the country. The deployment may be connected with the Kalashnikov factory scheduled to open later this year. Some have speculated that the troops are there to inspect and repair the Russian-made S-300 air defense system Venezuela received in 2013, which has been in need of maintenance for a while. The longer the Venezuela crisis drags on, the higher the chance that the opposition’s supporters will start to experience resistance fatigue. It’s taken the opposition two years to get to this point – to unite and gain the backing of major global players including the U.S. government. If it doesn’t force change soon, it’s in danger of losing support. And regaining momentum is far easier said than done. This week, technocrats and functionaries gathered to discuss economic policy, making decisions that will determine the near-term prospects of the eurozone economy. Also, the European Central Bank’s governing council held a meeting. For a steer on the currency union’s growth prospects, investors would be better off analyzing the output of China’s 13th National People’s Congress than that of Europe’s monetary policy makers. The ECB said Thursday it would hold interest rates at current levels for at least the rest of 2019, and issue new cheap long-term loans for banks in the second half of the year. Beyond its current effort, there is little the ECB can do in the face of an economic slowdown. It could restart an all-out quantitative easing effort, but that would involve abandoning self-imposed restraints on which government bonds it can buy. Nor will national governments ride to the rescue. The bloc’s fiscal rules prevent countries like France and Italy from pursuing meaningful stimulus. In Germany, the country with most room to pursue debt-funded spending, arguing for a sustained increase in borrowing is political anathema. That leaves the bloc, particularly its largest economy, increasingly at the mercy of decisions made not in Brussels or Frankfurt, but in Beijing. 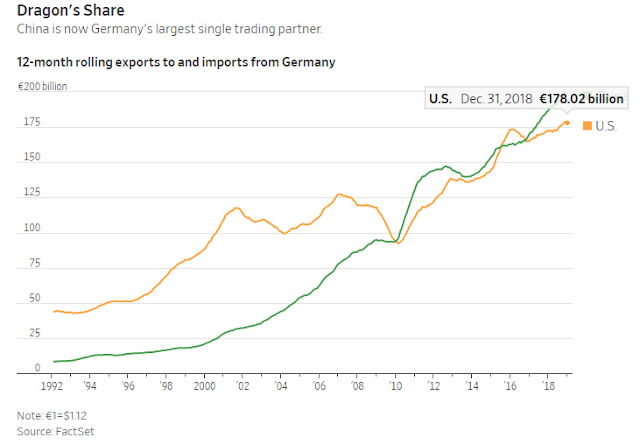 In 1991, U.S. trade with Germany was about five times as large as China’s equivalent figure. Now, the Middle Kingdom is Germany’s largest single trading partner. Even that understates the importance of the connection. China’s place in inter-Asian trade means that a slowdown there impacts German exports to countries such as South Korea too. A boom in German exports to China as Beijing pursued huge stimulus after 2008 was a major reason why the economy recorded such strong growth relative to its peers. Conversely, China’s slowdown in 2015 and 2016 helped push the eurozone into a period of deflation that sparked the ECB to begin a QE program. More recently, German exports to China fell 7.7% year-over-year in December, the weakest figure in almost three years. So far, the message from the National People’s Congress has been muddled: Chinese policy makers want to simultaneously keep debt levels in check while boosting borrowing to private companies. The headline from the congress—the lowering of China’s growth target to a range of 6% to 6.5% this year—should, though, alert investors that major external support for the eurozone isn’t likely soon. Even the stimulus measures Beijing has taken to date are unlikely to feed through until later this year. If the ECB’s lack of firepower is worrying, the fact that China won’t ride to Europe’s rescue this time is chilling. When I first went to Rhodesia in 1978, war was still raging, but I was able to find an entrepreneurial local publisher, Gordon Graham. At the time, there were still about 250,000 people of European extraction among the 6-million population. And it was clear most of them were eyeing the exits and wondering where to go. Most of the whites were native Africans, born to families that had been in the country for generations, and they felt they had just as much right to be there as the blacks. But when it comes to such things, it's not a question of rights but of political power. Today there might be 5,000 whites still hanging on. But making what they called “the chicken run” 30 years ago was definitely the smart course. However, few of them had a “bolt hole” elsewhere. In any event, my book flew off the shelves, as people desperately scrambled for alternatives. The problem – your problem – is that any country can turn into a 1970s Rhodesia. Or a Russia in the '20s, Germany in the '30s, China in the '40s, Cuba in the '50s, the Congo in the '60s, Vietnam in the '70s, Afghanistan in the '80s, Bosnia in the '90s. These are just examples off the top of my head. Only a fool tries to survive by acting like a vegetable, staying rooted to one place, when the political and economic climate changes for the worse. When the going gets tough, the mentally tough go elsewhere. The way your forefathers once did – at least, if you live in an immigrant-built country like the US, Canada, Australia, New Zealand, or Argentina. I don't know exactly when I became interested in exploring other lands. Maybe it began with reading Uncle Scrooge comics when I was a kid in the '50s. Uncle Scrooge (who is a fantastic character and one of the great heroes of American literature) was always taking Donald Duck and his three nephews off to an exotic clime for a high-adventure treasure hunt. Maybe it was when I wanted to be a paleontologist and read about Roy Chapman Andrews (a model for Indiana Jones) rooting for fossils in Mongolia. Or when I decided I'd like archaeology better and read about Heinrich Schliemann discovering Troy. But a couple of specific things really set the bit in my teeth. One was when I was in Milan, looking to buy a Ferrari. The seller was a guy I remember well, Viviano Corradini, who was actually an American. I asked him why he was living in Italy. “You see this?” he said, as he veered the car way into the opposite lane and back again a couple of times, then slammed on the brakes, then accelerated – a wild little ride. “You can't do this in the States. They'll throw you in jail. Here, you can do anything you want!” He was right. After I bought the car we realized I didn't have any plates, so he reached up into a closet and found some old New Jersey plates. “Here. Use these.” I did, no problem, for the next six months, all over Europe. It gave me some practical reality about not being controlled by other people's arbitrary rules. Another was in Switzerland, when I was hanging around for about a month with an ex-Foreign Legionnaire named Ron Schneeberger. He was planning to rob the national bank of Haiti, figuring that Papa Doc had about $50 million in negotiables sequestered there. That was a lot of money in those days. Ron reasoned, quite correctly, that if you robbed the corner liquor store, you'd get $50 and likely get killed. If you robbed an ordinary bank, you might get $5,000. But if you hit a government… who was going to pursue you? But the point is that, at different times, there are places that are good for doing certain things. And places where it is bad to be. Who wouldn't have preferred to be in the USA, rather than the USSR, from 1920 to 1990? Ireland was a dismal, depressing place for decades after WW2; then in the '90s it blossomed. Africa was a very safe, prosperous, and enjoyable place before about 1960, when it started to degenerate into a giant hellhole. About every country on the planet has had its good times and its bad times; that's one reason the original Baron Rothschild sent his sons to several different ones. Some countries, like Russia, have been living at Hard Times Central since day one; others, like the US, have had good times for a long time. A wise man, at least in my view, doesn't allow himself to be limited by an accident of birth. It's most unfortunate (for them, anyway) that most people have a peasant mentality. They're idiotically indoctrinated into thinking that their country is the best place in the world, simply because that's where they were born. It makes sense in a way; their ancestors rarely ventured more than a day's walk from the village where they were born. After all, there were stories of dragons and demons over the hill. Things haven't changed much, except people have exchanged the mud hut for a McMansion. But they've retained that medieval serf worldview. And the CNN and BBC newscasts on their widescreens only reinforce the notion that things are dangerous outside their borders; they're probably even more scared than their primitive ancestors. Assuming they watch anything beside sitcoms and sports. It's certainly possible to be happy living your whole life in the place you were born and grew up. But unless you were born a member of the lucky sperm club, it's almost always suboptimal, and sometimes it can be disastrous. I suspect now is one of those unhappy times. We're of the opinion that the world at large, and the US in particular, is heading into some seriously turbulent times. The diminution of personal and financial freedom looks like a hyperbolic curve, at first with an almost unnoticeable slope, then one that gets steeper and steeper, at an accelerating rate. I think an excellent case can be made that the current crisis is an inflexion point, beyond which it goes vertical. A crisis (and this will be a very real one) always draws exhortations from the authorities to “unite” and “pull together” – which usually boils down to following orders and turning in those who don't. People will want, and will get, “strong leadership.” This does not bode well for libertarians, classical liberals, and free thinkers, in general. As the crisis deepens, it's likely to be dangerous for someone who doesn't agree with groupthink. Things are likely to be much mellower if you're living somewhere they consider you a tourist, than to stay on your home turf where questions will be asked if you don't join the hooting and panting chimpanzees that will surround you. You can absolutely plan on unwelcome social pressure in the years to come, especially as the wars expand. Coincidental with this is going to be the near destruction of the US dollar; I just don't see any realistic way around that eventuality at this point. The consequences of that are going to be disastrous, but it's possible to insulate yourself from many of them. The biggest problem, and also the one most people just don't see, is political. There is almost no way you can effectively insulate yourself if a government, and society as a whole, goes crazy. You might argue that really tough times in the US are a long shot; the US is “different” from other countries. It's certainly true the US has been particularly blessed for most of its existence, because it actually was different. The problem is that what made the US different from every other country – a Constitution that expressly limited the powers of the state, and an explicit acceptance of property rights and the free market – has evanesced. It's why I refer to it as the US, which is just another country, rather than America, which was a unique and excellent concept. In any event, I suggest you at least consider the possibility of transplanting yourself, or at least start by transplanting some assets. Don't look at it as a negative thing. The world is your oyster. Make the most of it. This is directed not only at Americans, but at everybody, everywhere. It just seems a little more urgent for Americans, as well as for Europeans, at this point. In many ways the world seemed to turn over a new leaf in the '80s. Not just with the election of Reagan and Thatcher, but with the appearance of many more like them, almost everywhere. Whether it's the “hundredth monkey” hypothesis, or whether there really is such a thing as the “spirit of the century,” the majority of people tend to hold similar views at the same time. It's strange. From about 1980-2000, all over the world, tax rates went down, regulation was relaxed, markets were freed up. The Soviet Union collapsed, apartheid in South Africa nonviolently disappeared, New Zealand fired two-thirds of its government employees, China liberalized. Even the constipated continents of Europe and South America loosened up. It looked like freedom was in the ascendant. But it couldn't last. Now, certainly since September 11, 2001, the tenor of the world has changed again – radically. And the negative new trend has been supercharged by the financial crisis that began to unfold in 2007. Now practically everywhere, much higher taxes, onerous new regulations, border controls, and capital controls (to prevent the make-believe crime of money laundering), among other things, are the new order. It seems as if the clock has been turned back to the 1930s, but much worse, in that governments are much more powerful. And I fear a redux of the 1940s is in store. The whole world acted pretty much the same in the '30s and '40s as well, you'll recall. One thing I think you can plan on is foreign exchange controls. A government turns to FX controls during a currency crisis, to prevent its citizens from swapping the local currency for something foreign – transactions that would further weaken the local currency. FX controls, in effect, force people to stay with a sinking ship. But they are politically popular, for a number of reasons. They allow the government to “do something” during a crisis. They appeal to the average yahoo, partly because he doesn't travel abroad and tends to question the patriotism of those who do. Only the rich (especially the “unpatriotic” ones) have assets out of the country, and it's now time to eat the rich. We're heading into a currency crisis for the record books, and I think you can plan your life around some type of FX controls. If you don't get significant assets out of your home country now, you may soon find it costly and very difficult to do so. Already, very few foreign banks and brokerage firms will take accounts from US persons. But although there are reporting requirements, there's currently no law against Americans having overseas accounts, and no laws against foreign banks and brokerage firms accepting American business. Many institutions find that it's simply not worth the aggravation and worry to deal with Americans. At a bare minimum, you should have a meaningful amount of gold in a foreign safe deposit box. In addition, you should own some foreign property, preferably in a location where you would enjoy spending some time. These things are currently not reportable, and it would be impractical for the government to get you to repatriate that capital. The ideal scenario, of course, is to have your main residence in one country, your assets in another, your business in a third, and your citizenship in a fourth. That isn't practical for most. But you can certainly get assets abroad. And you may want to consider acquiring a second citizenship, which can considerably expand your options. The International Man has a lot on this topic. It's not necessary, and often not even desirable, to establish official residency in the country where you'd like to spend time, because that risks getting stuck in its tax system. It's usually smarter just to leave every 90 days to renew your tourist visa and not spend more than six months per year in any one country. That way you'll be treated as a valued tourist, who should be courted, rather than as a citizen, who can be milked like a cow. Once you do acquire another passport, the next question is whether you should renounce your US citizenship, which could give you huge tax and regulatory benefits. As everyone knows, the US is one of the few countries in the world that taxes its citizens regardless of where they may live – although it must be said that other governments seem to be moving in this direction. The problem with renouncing your US citizenship is that the US assesses what amounts to an exit tax on Americans who do so. Since 2004, any high-net-worth individual who renounces his citizenship is automatically assumed to have done so for tax reasons. And any individual deemed to have expatriated for tax reasons is deemed to have sold all his assets at fair market value on his last day as a US citizen. And, if the expatriate spends more than 120 days per year in the US, he can be taxed on his worldwide income and potentially is subject to estate tax. I wrote The International Man as a guide for those who were looking for a place that could offer more of what they want. I can't rewrite the book in this short report. But it's worth making a few observations about the world in general, then about some areas and countries in particular. First, there may not actually be any one “best” place, simply because you're dealing with the human animal, who's subject to all manner of fears, hysteria, vices, and assorted aberrations. I don't know where Shangri-La is located. Therefore, you want some degree of diversification, so you always have a “Plan B” available. Second, there are roughly 225 distinct political entities around the world, and there are likely to be more as time goes on. There are advantages to places that are unstable, poor, repressed, and backward, just as there are disadvantages to places that are stable, rich, free, and advanced. A lot depends on who you are and what you want to do. Try to keep an open mind. Third, I don't think there's any doubt that the West – meaning North America, Europe, Australia/New Zealand, and Japan – is in relative decline. Meanwhile, places like China, India, and Vietnam are on the way up. The reasons are simple. In the developing world, a worker earns between 1/5 and 1/30 what his counterpart does in the West. But he's just as smart, might be even better educated, is likely to work twice as hard, and has less of an attitude of entitlement. It may be true (but less and less) that the developing country has less infrastructure. But now a number of them have telecoms, roads, airports, and such that are among the world's newest and best, while many of those in the West are falling apart. At the same time, the general level of taxes and regulation tends to be much lower in developing countries; that's a big reason why they're developing. Part of the better social ambiance is reflected in people being free of debt; they may not make much, but they save something like 10% to 20% of what they do make. So, instead of a mountain of debt that must be paid off, there's a growing pool of savings to be invested. The days of automatically having the odds tilted in your favor simply because you were born an American are coming to an end. By the end of this century, wages will be more or less normalized the world over. Americans also have had a huge advantage in speaking English, the world's most commonly spoken language, its lingua franca, and the language of science, business, aviation, entertainment, and other fields. But that advantage is also diminishing, as almost every educated person now has English as a second language. Most Americans have only English. Negatives? Many of these places have large bureaucracies, as a legacy from buying into various strains of socialism imported from Europe. There may not be much regulation (of the type we have in the West), but there are still plenty of forms that need to be processed and approved. In order to make things happen, bribes must be paid. I've discussed the ethical implications of paying bribes in the past, but suffice it to say that as developing countries become freer and wealthier, bribery and general corruption will likely diminish. At the same time, as the US becomes less free and wealthy, bribery and general corruption will greatly increase.